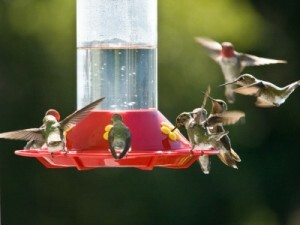 The first migrating ruby-throated hummingbirds have arrived in Texas. Attract numerous colorful hummingbirds to your yard this year with Hummingbird Supplies from Lochte Feed & General Store in Fredericksburg, TX! We carry a variety of feeders and nectar to attract these beauties to your yard. Purple martin houses and a large selection of bird seed is also in stock. Attract the flocks this Spring to your backyard haven. This entry was posted on Wednesday, March 15th, 2017 at 5:50 pm	and is filed under News & Updates. You can follow any responses to this entry through the RSS 2.0 feed. Both comments and pings are currently closed.